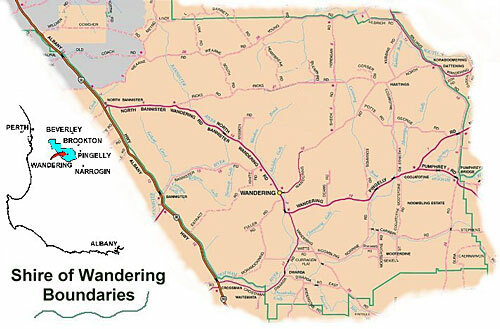 The town of Wandering is located 120km to the south east of Perth 27km off Albany Hwy. The Shire of Wandering has an area of 1,955km sq. of which some 900km sq. is State Forest. The population of the Shire, as of the 2010 census is 439. The Shire borders the local authorities of Armadale, Serpentine-Jarrahdale, Murray, Boddington, Williams, Cuballing, Pingelly, Brookton and Beverley. Major agricultural activities include cereal crops (oats, wheat, barley) pulse crops (lupins, chickpeas, faba beans) oil seed (canola), sheep (wool & meat), cattle (meat), pigs and vineyards. Other commercial industries include wineries, timber milling and hay exporting. A range of local commercial services exist. Services provided include a primary school (with bus services to Boddington for junior high school education). Major sporting facilities include oval (cricket), tennis/basketball/netball courts, badminton courts (inside Community Centre) and golf course (Wandering Golf Club Inc.). Wandering is within the State electorate of Wagin and the Federal electorate of Pearce. The town of Wandering is located at latitude 32 deg. 40'35" south, longitude 116 deg. 40'07" east at an elevation of 280 metres with a mean average rainfall of 617.7mm. Wandering is located 129km south east of Perth. 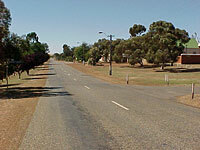 Travel along the Albany Highway turning at North Bannister to reach the town of Wandering.